Jamaica ( i/dʒəˈmeɪkə/) is an island country situated in the Caribbean Sea, comprising the third-largest island of the Greater Antilles. 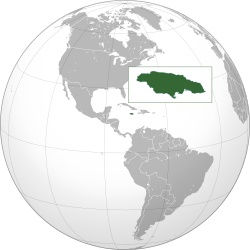 The island, 10,990 square kilometres (4,240 sq mi) in area, lies about 145 kilometres (90 mi) south ofCuba, and 191 kilometres (119 mi) west of Hispaniola, the island containing the nation-states of Haiti and the Dominican Republic. Jamaica is the fifth-largest island country in the Caribbean. The indigenous people, the Taíno, called itXaymaca in Arawakan, meaning the “Land of Wood and Water” or the “Land of Springs”. Once a Spanish possession known as Santiago, in 1655 it came under the rule of England (later Great Britain), and was called Jamaica. It achieved full independence from the United Kingdom on 6 August 1962. With 2.8 million people, it is the third most populous Anglophone country in the Americas, after the United States and Canada. 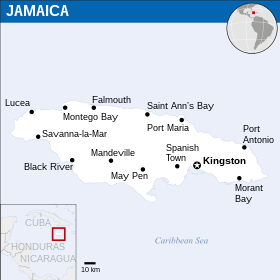 Kingston is the country’s largest city and its capital, with a population of 937,700. Jamaica has a large diaspora around the world, due to emigration from the country. Jamaica is a Commonwealth realm, with Queen Elizabeth II as its monarch andhead of state. Her appointed representative in the country is the Governor-General of Jamaica, currently Patrick Allen. The head of government and Prime Minister of Jamaica is Portia Simpson-Miller. Jamaica is a parliamentaryconstitutional monarchy with legislative power vested in the bicameral Parliament of Jamaica, consisting of an appointed Senate and a directly elected House of Representatives.